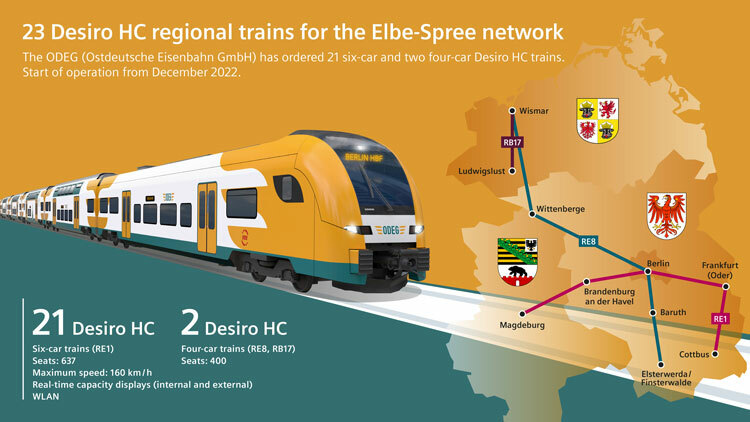 Ostdeutsche Eisenbahn GmbH (ODEG) has ordered 23 Desiro HC regional trains from Siemens for service on the Elbe-Spree network. The order is worth approximately €300 million. 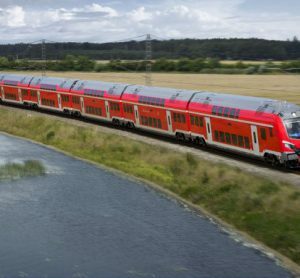 The multiple-unit trains are planned to be used along the regional lines RE1, RE8 and RB17 on the new Elbe-Spree network. In January 2019, ODEG was awarded the contract to operate these lines following a Europe-wide tender by Verkehrsverbund Berlin-Brandenburg (VBB). The contract includes the option to expand the capacity of the RE1 trains when the station platforms along this line are extended. 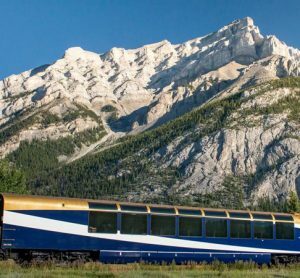 Delivery of the 21 six-car and two four-car trains is scheduled to begin in the summer of 2022. The start of operations is planned for the timetable change in December 2022. The trains will be built at the Siemens plant in Krefeld, Germany. In November 2017, VBB announced a pan-European tender for the ‘Elbe-Spree Network’ (NES) on behalf of the states of Brandenburg, Berlin, Mecklenburg-Western Pomerania and Saxony-Anhalt. Operating roughly 27 million train-kilometres a year, the NES is the largest regional railway network in Germany to date that has been tendered. 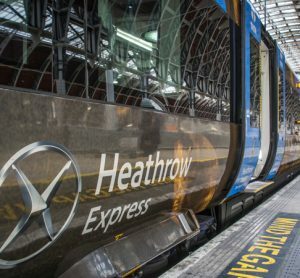 The tender comprised 17 regional express and regional railway lines as well as the airport express (FEX). The tender was divided into four lots, and lots one and four were awarded to ODEG. 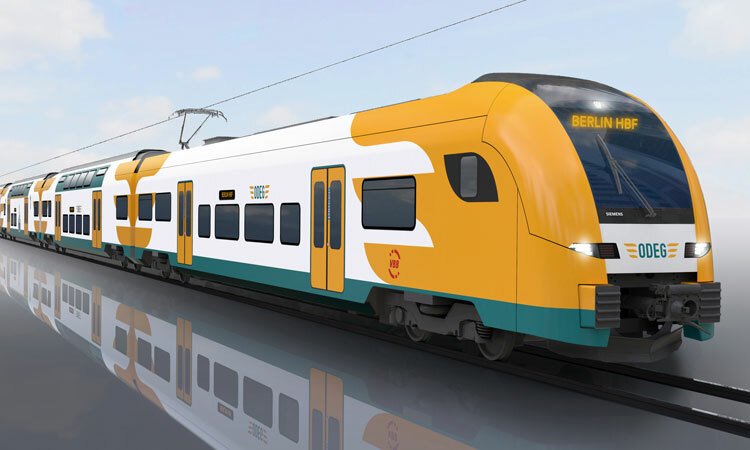 The six-car Desiro trainsets will be used on the regional express line RE1 (lot 1) connecting Magdeburg with Cottbus via Berlin and Frankfurt (Oder). During rush hours, trains will operate three times an hour between Brandenburg a. d. Havel and Frankfurt (Oder). The four-car Desiros are planned for service on the RE8 line connecting Wismar and Wittenberge with Baruth and Elsterwerda/Finsterwalde via Berlin, as well as on the RB17 line connecting Wismar and Ludwigslust. When operating at 20-minute intervals during rush hours, the trains will provide 637 seats. An option in the contract would increase their capacity to 800 seats. 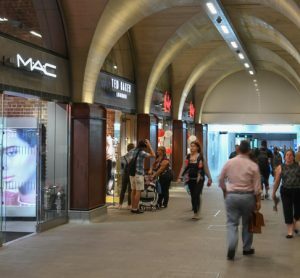 The trains have generous space available for bicycles, strollers and wheelchairs and a multipurpose car with a barrier-free WC. Sliding steps enable barrier-free access at stations with 550mm and 760mm platform heights. Wider doors than in older trains speed and ease passenger boarding and exiting. Free WLAN on-board enhances passenger convenience. A passenger safety system provides live camera coverage of activities in the cars. In case of a conflict or problem, supervisors at the operations control centre can communicate directly with the car via loudspeakers. The cars are equipped inside and outside with real-time capacity displays, and this information can also be accessed via the VBB app.